We've got two great new features launching today, after nearly 4 months of development: heatmaps, and on-site analytics. (Note: Everyone's user homepage is unique so some of the hot spots look weird here when conglomerated on a global scale. That's the nature of dynamic pages). IMPORTANT! Heatmaps won't start logging anything until you specify your site's width and layout in your site preferences. You can see where to do that in this screenshot. 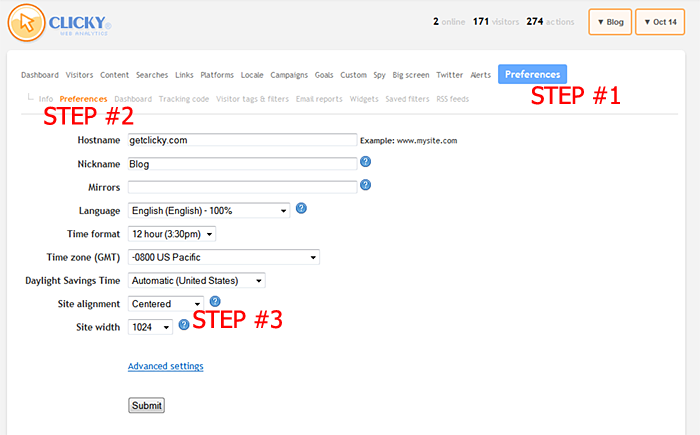 And as with on-site analytics, you must have the newest tracking code in your browser, so clear your cache! Over the years we've had a lot of requests for this feature and we're psyched to finally offer it to you. But once we started on it, the idea for on-site analytics was born soon thereafter, making this otherwise fairly-simple feature spiral out of control (in a good way). Hence nearly 4 months of development and testing! Most services, to view heatmaps, you go to their site (e.g. getclicky.com) and go to your heatmap report, click a button for the page you want to view heatmaps for, and then your site is opened in an iframe, and then a heatmap overlay is loaded on top. That's unideal for a lot of reasons, but particularly the iframe (ugh). Loading a site in an iframe introduces a lot of potential problems, and a lot of sites have "frame busters" that would totally break this feature. So we took a different approach. What we do differently is that your page loads directly in a new window with a special parameter in the URL fragment, that our tracking code recognizes and automatically loads a heatmap dynamically on your site - without a frame, and without requiring being logged in to Clicky (i.e. you can share the URL). So that's good. But we thought it would be so terrific if you could just be on your web site and say "I want a heatmap of this page, now" and just click a button on that page and see it immediately. So that's what we did, and hence made it part of the on-site analytics experience, as you can see to the right. This was still not enough for us. Even though very few of our real-time competitors offer heatmaps, we didn't want to just make a "me too" feature. We believe most of the features we are releasing with our heatmaps are unlike anything that any other service offers. Second, what would be analytics without segmentation? You can view "global" heatmaps (all clicks) for any page, or you segment them by a number of criteria. For example, only view clicks on a page for people who completed a specific goal, or only people who arrived via a specific search or campaign or referring domain or type of referrer (e.g. advertising), or any/every version of every split test you're running. The order of items in these reports is a bit different than what you see on our web site. We take the top 24 items ordered by "popularity", e.g. the top 24 goals completed today, then re-order them alphabetically. This is because we think you'll generally want to see the most popular segments but you'll also want to find them quickly - so instead of showing them in order of popularity, we grab the top ones and re-order them alphabetically so you can quickly narrow down what you're looking for in the interface. To generate segmented heatmaps, we needed to add a new filter type to quickly find visitors with heatmap data attached. So we made this a general filter as well. 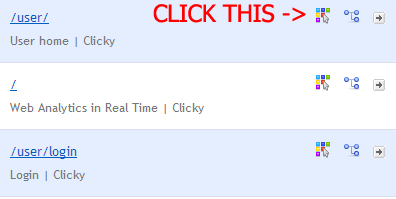 In the main visitors report on Clicky, when you click "add a filter", you will see a new option callled "heatmaps". 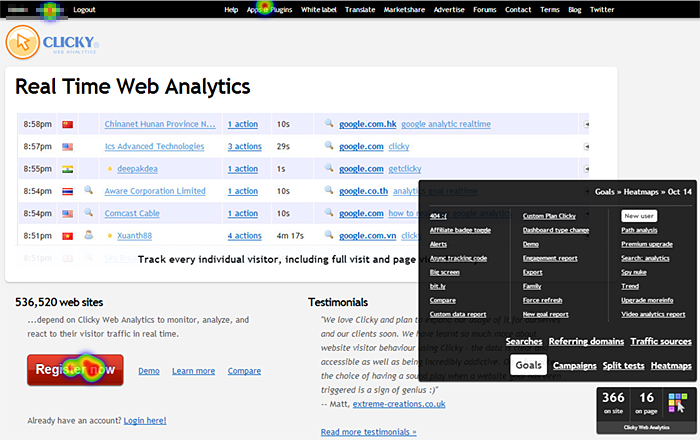 Click that to filter down your visitors to just people with heatmap data attached. This also works with the analytics API, by specifying "heatmap=1" in combination with type=visitors or type=segmentation requests. (We also added a filter for "online now", since we needed to be able to internally filter visitors who were online now in order to display in the widget. Via the API, use "online=1"). Not every visitor will have heatmap data though... We anticipate this type of data to take up a lot of space, so for now we only do it for a random 50% of your visitors. We will likely adjust this in the future as we see what kind of impact it has on our resources. For example, it is quite likely we'll increase the sampling rate for low traffic sites, maybe even do "all visitors", and for higher traffic sites, do less than 50%. But for now, just doing 50% was an easy safety measure and we'll analyze resource impact as time goes on. This will be the first feature we offer that is not included in the standard Pro plan. The Pro plan has always had every feature we offer, so this was hard to do. But, the resources needed for this feature are quite significant, both in terms of bandwidth and storage, so we can't justify the standard Pro pricing for this feature. We do want all of you to experience it first hand though, so for the first 4 weeks, all Pro or higher accounts will have this feature. After 4 weeks, a Pro Platinum or Custom plan will be required to keep the heatmap feature. On-site analytics will be standard with any Pro or higher account, though. As we said above, we anticipate this taking up a lot of storage space, so we built the database structure around monthly chunks that are auto-purged every 30 days. Initially, daily/session data will only be guaranteed for 30 days, but be available up to 60 days, and monthly data will only be guaranteed for 2 months, but available up to 3 months. It's hard to anticipate the exact impact this will have on our resources so we may (and hope to) expand this limit in the future, but for now, this is all we can guarantee. Internet Explorer, may I count the ways in which I love thee? Prior to IE8, IE does not have native JSON support, and even then, only when your site runs in standards mode. IE causing developers headaches is as sure as the sun rising in the east, regardless, the point is that IE users will not have heatmap data logged unless they are on at least version 8 and your site renders in standards mode. Good luck! So this feature doesn't actually work if you have a dynamic or fluid width layout? With the increasing popularity of responsive design/themes/layouts etc wouldn't this have been a prudent consideration to take? Wow, thanks for this new feature - as far as I can tell from the first few hours of testing I really love it! Seems to work fine on responsive sites, too, if you set both site width and alignment to "liquid". After turning this on, I can see you can choose a liquid width - please disregard my earlier comment!!! This new feature is lovely, great, fantastic!! Only thing that causes a problem for me is that it is painted over the instant chat plugin I have on my website. If you can add the possibility to move it around (left, right, top, bottom), it will be even cooler! I'm not seeing the heatmap icon. Do I need to update my tracking code? This feature blows my mind! Very impressive implementation. My question is, what will be the policy for this feature for us 'early-adopter' Super-Pro users? Are we considered a type of 'Custom' account, and therefore will have this feature available to us after the initial 4-week period (I humbly submit my interest for this reality!)? I can understand why the heatmap might not be possible for fluid layouts, but why are the heatmaps restricted to set widths? My width is 908 (unfortunately), so 800 and 1024 may produce some weird results? To activate heatmaps, do we need to do anything other than have the Pro Platinum account or higher and set our width and layout in preferences? Because I've done all that, and I'm not seeing the icon in my account or in the new gizmo only I can see. Does that mean there's just no data for it yet, or am I doing something wrong? @Ivan, custom position on site would be a nice addition. I'll do that. @Coby, for people with old school "super pro" accounts, those will include the heatmaps, yes. @Everyone, when you enable heatmaps, it will be up to 2 hours before it starts logging, because several levels of caching needs to expire. The width you choose doesn't have to match exactly, just choose the smallest one that still fits your web site, e.g. 900px web site = choose 1024. I enabled it more than 2 hours ago, assuming that "enabling" is just setting the width and layout. I didn't see any other options in my preferences. Jen, send us an email if you haven't already, along with what site this is for. I am re-reading the "A difficult decision" paragraph for the 3rd time since this afternoon, and can't help thinking that your decision (being difficult as it is) is far from perfect. I am a paying customer, have been so for more than 3 years, and am loving the service I receive. However, for all features so far, subscription payment has always been reasonably linked with number of websites/visits, etc. For the first time we get a feature that differentiates between levels of paying customers and while I totally understand that the heatmaps strain your infrastructure and cost money to implement/maintain, I simply cannot get it why 'small' service plans (Pro) should not be eligible for this feature and Pro Platinum and upwards will have it. See, I am presently monitoring 6 low-traffic websites, and the Pro plan is fine for me. If I have heatmaps, I will enable them for two of these 6 websites, maybe 3 at most, so it seems to me that I will put far less stress on Clicky than somebody on Pro Platinum who uses heatmaps on 30 out of 30 heavily visited websites. Please don't get me wrong - I do not want something expensive for free and I am very willing to pay for this feature, but I feel that Clicky are asking simply too much for it: I need to start paying $100/year to service the same 6 small websites just to get the heatmaps on half of them. I will gladly pay a reasonable amount if Clicky can offer me 'per site' fee for this new service, as an extension to my annual subscription. The money I could be paying to CrazyEgg can go to Clicky and all of us would be merrier. So, once the dust settles and the new features have established some usage track record, I hope Getclicky will reconsider their pricing structure and allow smaller paid plans to take advantage of this great new feature. Ah, it's showing up on my busiest pages now. Took 2-3 hours. I imagine the rest will just take longer because it needs more data. Thanks! It does not work in Chrome, only IE works. I hit refresh a few times in chrome and now it shows up. The only problem is with the page size, not very accurate. So is this tracking clicks, mouse? Does it heat map the real location of the click, or is it just "highlighting" a link that users click? 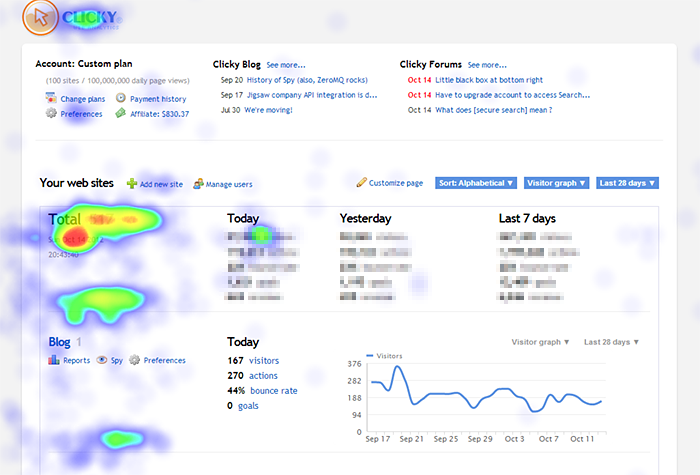 Is it more like a Google Analytics style or a Click Tale style heat map? So, I have what's maybe a stupid question, but: what is the heatmap measuring? In most of my pages, the activity falls on links, which is what I expected since I thought heatmaps measured clicks. But I have one page with blue spatters all through the text. Does this mean people are actually clicking on random, unlinked text? Yes it's tracking clicks. Most clicks will be on links or images, but yes people click randomly throughout pages as they read text. I know I do it, and after viewing heatmaps for our site for the last 2 days, plenty of other people do too. Thanks for the clarification! I guess I do it sometimes too, usually when my mouse's focus has shifted elsewhere and the browser is ignoring my scroll wheel input. So those blue splatters are a good indication of where people stop scrolling down and reading as well as what links they click. Awesome! This is a fantastic feature! I've selected the height and width for my pages (liquid) and it's been several hours and I still don't see the heat map icons when I go to Content > Pages. I also don't see it in the "on-site" analytics at the bottom of the pages on my website (just the "on-site" and "on page" visitors). Is there anything else I'm supposed to do to get this enabled? Great feature, you are in the right track as usual. We use the same Clicky Tracking code on Multiple websites (sub-domains). These have different layouts. How will this affect the sites width setting. What should I put? I have a custom account with all the Pro features, except the heat maps option. I would love to try this out for the 4 weeks, if possible? The pop up to choose date range on the heatmap has no effect, it just stays on the current day. It seems the Heatmap does not work if we have Cloudflare enabled. Is this correct? Awesome, thanks for listening to our feedback and implementing this! I enabled it but haven't seen the widget appear on my sites which use cloudflare, is it compatible with rocket loader? @Michelle, the heatmap icon won't show up when viewing a certain page unless that page has heatmap data attached to it from the last 7 days. Be patient, there will eventually be data! @Adam, custom plans have this feature. Everyone with any premium plan, other than "Starter", has this feature. @Ivan, we're thinking about various options. One thing I'm considering is just having the sampling rate be low for normal Pro plans. For example, maybe only 10% of visitors would log heatmap data for Pro, but Pro Platinum would get 50% as it the current sampling rate. I think the platinum pro costs too much per month to upgrade. i.e. Platinum Pro is $10 a month more expensive that Pro. Crazy Egg (leaders in heat mapping) you can subscribe for $9.99 a month. You are offering a lot less than they provide, so I guess you will find most people will just sign up for a 3rd party service instead of using your offering at that price point. Oh, after a nice surprise (at last we got heatmaps!) a huge disappointment (not for Pro accounts!). You should find a way to offer heatmaps to Pro accounts, even if they are limited in some way: only to 25% of visitors, only data for last week, whatever... but allow us to use it. The new heatmap feature is great. It would be very good if you could add a figure for how many visits/clicks that made up the heatmap. You could add that to the popup you get when clicking the heatmap icon down in the right hand corner. That way we could see the visit to click ratio and also get a feeling for how big the dataset making the heatmap up is. Later on something like the Crazyegg confetti view would be great as well. I really hope you will come up with a way of getting this feature in to the pro account. I am sure you want to stay away from adding it as a bolt on option. Still it would be pretty good be able to add it on to the pro account and select the recording ratio as a percentage, or maybe a selection of 25%,50% or 100%. This absolutely great! Thank you guys for making this. I do have similar problems like someothers above though. The fixed width sizes in the preferences do not match my sites width. Would be nice if you could come up with a solution for that. I know you are just starting to collect usage data that may influence your pricing, sample rates etc. but please consider: Some (many?) pro account users have really low traffic sites. For instance one of mine (http://www.tourdeforce360.com) averages maybe 50 visitors per day, and another (scottwitte.com) maybe 4. That is fine for their intended purpose. But if you only sample 10% of visitors it will be really minimal (almost useless?) data while sampling 100% of visitors to a low traffic site will have almost no resource impact. The argument is even stronger scaled up. A site getting 10,000 visitors per day would get just as accurate a picture sampling 10% as 50% of visitors. The fewer visitors you have the larger the percentage that should be sampled to get accurate results. NO? Keeping this in mind you could better balance resource demand with useable results by basing sample rates on traffic volume, not plan price. In the process you could continue to offer heatmaps to low volume pro accounts and make all your customers very happy. BTW, totally cool feature. Looking forward to seeing how useful it proves. "You are offering a lot less than they provide"
Even upgrading to their highest plan of $99/month, that still only gets you 250,000 monthly page views and 100 unique pages. On top of that, we also do visitor-level heatmapping, which as far as I'm aware, *no* service offers. They do scroll heatmaps, I'll give them that. And we don't have a "Confetti" feature, although our segmentation with heatmaps is the same thing, except you can only view one segment at a time rather than all at once (which is kind of hard on the eyes anyways if you ask me). Keep in mind I am not putting down Crazy Egg here, I think they have a great service and have recommended them to many of our users over the years when we got requests to add this feature. But to say we offer a lot less than they do? Sorry but that's ridiculous. I think the heatmap implementation of Clicky is better than Crazy Egg in terms of overall information that the user receives. I haven't used Crazy Egg in the last 4-5 months, but when I tested the service I came to the conclusion that it is tremendously helpful for fine-tuning landing pages, and next to worthless when you try to analyze how people move around the website and do stuff, because of their "screenshots" structure which is built around watching single pages. Hence, I feel I still need to push on the issue of getting usable heatmaps for Pro level accounts, either as a free feature (with strings attached) or as a paid upgrade to the monthly subscription that doesn't cost an arm and a leg. I think that a low sampling rate for Pro level accounts diminishes greatly the informational value of the whole heatmap feature. See, on some of my websites, I get 200-300 visits a day; on others, 50-60 visits a day. Getting a 10% sample of all visits will distort the results simply because of the small base I work with and the stochastic error. The amount of traffic Clicky services on my behalf is insignificant; yet the usability of the heatmaps feature is greatly reduced for me. So I would have to say no, a decrease in the sampling rate is not a good solution. This simply puts things in a wrong perspective. Low volume paying users that put less strain on the system are getting less value than larger users. Perhaps you could consider a model similar to the one used by MouseTrace where you have a monthly limit on number of captured sessions? If you give your Pro users 1000 (number picked arbitrarily) heatmap recordings per website per month, and these heatmaps track 100% of the visits, I think it will give us a better understanding on how visitors interact with our websites which I guess is the whole point of the new feature. If you want to compete with ganalitycs which is a free service, then offer full features for pro accounts or this limit to pro accounts will make the heatmaps useless, because I will still need to look at google in-page analitycs to see all the clicks even if in-page analitycs does not look as good as your heatmaps. "@Adam, custom plans have this feature. Everyone with any premium plan, other than "Starter", has this feature." @Sean - then where the heck is it? If I'm supposed to be seeing it then there's a bug. Was excited to learn about the heat map feature, but pretty upset that I'll have to pay an extra $100 a year to actually use it. There is no button that says "turn on heat maps." The instructions are a little less than clear, but go to the preferences tab for each website, click the preferences submenu, then set "site alignment" and "site width." Once clicky has that info it will start tracking data for heatmaps. Hope that helps. What do you think about basing sample rates on visitor volume instead of plan level? (See my earlier comment.) I still think this would allow superior tracking data with less resource demand and hopefully allow you to offer heatmaps to pro accounts for no added cost. Of course you may want to use heatmaps as a way to increase your revenue stream regardless, which is entirely up to you. Users would simply need to decide if the added cost was worth it. The page couldn't be more clear - for 9.99 a month, 79.99 a year, you get heatmaps. Except, of course, you don't. And while I presume this is an honest mistake while GetClicky works out it's marketing and pricing, the challenge is that anyone who buys a one year subscription while their own website is displaying this marketing page has a legitimate argument that GetClicky is legally obliged to honor that marketing claim and provide heatmaps for the entire year. That's going to be a major challenge for GetClicky's marketing - they are going to hate to raise the Comparison page to 19.99 (which is what it should be right now if they want to be honest), and they are going to hate to take HeatMaps off the list. I think they are going to do neither, and settle for a little * asterisk by Heatmaps with a disclaimer, but that's a bit of a cop out. * Does not actually include co-starring in a blockbuster movie. Advertising should never make us feel like someone is trying to pull the wool over our eyes. The compare page shows all of Clicky's features, not necessarily corresponding to what you get for $10/month. Of course that has always been the case up until now. But you will see if you go to the actual pricing or upgrade pages, that as of right now, Pro is listed explicitly as not having heatmaps (although currently it does, for 3 more weeks). We're still not sure on what will actually happen 3 weeks from now. Maybe there'll be a lower sample rate, or maybe there'll be a daily limit for the # of heatmaps clicks we will track, or maybe Pro won't get the "per session" heatmaps. These are all possibilities we're considering. great idea, but all I see is colored globs all over my pages, in places where there are no links. This is a great feature congrats. No doubt some teething problems, but look at when Windows XP came out first time around!